On Dec. 21, 2017, NPR’s Camila Domonoske reported “Cities Across The U.S. Honor ‘Homeless Persons’ Memorial Day.””They pass quietly, often out of sight, their deaths more likely an unconfirmed rumor to those who knew them on the street than the basis for a news story,””Many never get a funeral. Some of their bodies go unclaimed at the morgue.” Homeless groups across the country held vigils reading the names of the homeless people who have died over the past year. On Feb. 17, 2015, Mother Jones reporter Scott Carrier wrote an article “The Shockingly Simple, Surprisingly Cost-Effective Way to End Homelessness” about the Salt Lake City approach for the homeless. They spend $10,000 a year to house, feed and care for them. This is cheaper than spending $20,000 putting them in jail or hospital emergency rooms. Carrier said “We could, as a country, look at the root causes of homelessness and try to fix them. One of the main causes is that a lot of people can’t afford a place to live. They don’t have enough money to pay rent, even for the cheapest dives available. 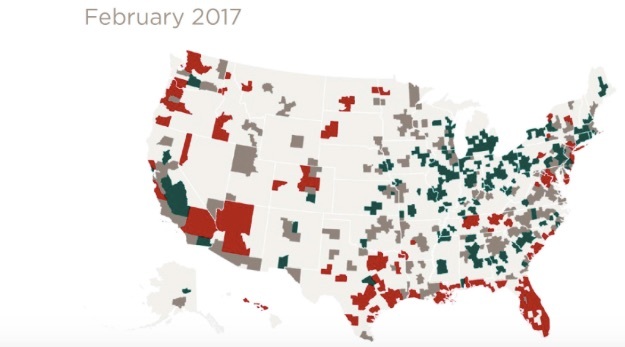 Prices are rising, inventory is extremely tight, and the upshot is, as a new report by the Urban Institute finds, that there’s only 29 affordable units available for every 100 extremely low-income households. So we could create more jobs, redistribute the wealth, improve education, socialize health care, basically redesign our political and economic systems to make sure everybody can afford a roof over their heads.” Or, we could give a trillion dollar tax break to the richest one percent. On May 25, 2017 Mother Jones’ Jenny Luna reported “Trump Takes a Big Bite out of His Voters’ Food Stamps”. According to the Center on Budget and Policy Priorities, the Supplemental Nutrition Assistance Program (SNAP) helps large numbers of people in Red states. “Trump’s proposed cuts to food stamps will by and large hit the states that voted for him the hardest. Louisiana voted overwhelmingly for Trump, as did its Southeast counterparts Mississippi, Alabama, West Virginia, and Georgia. Out of the 10 states with the highest food stamp use by population, seven voted Republican in last year’s presidential election.” According to Third Way, the budget for Women, Infants, and Children (WIC) will be cut from $6.35 billion this year to $5.15 billion next year. Meals On Wheels is also on the chopping block. It is sad that any politician would want children, the elderly, disabled or anyone to go hungry.